Our first Community Photo Day was a big success. Many came out to see historic photos and visit with our volunteers. GHS photographed, edited, and copied 236 photos for our attendees and members. 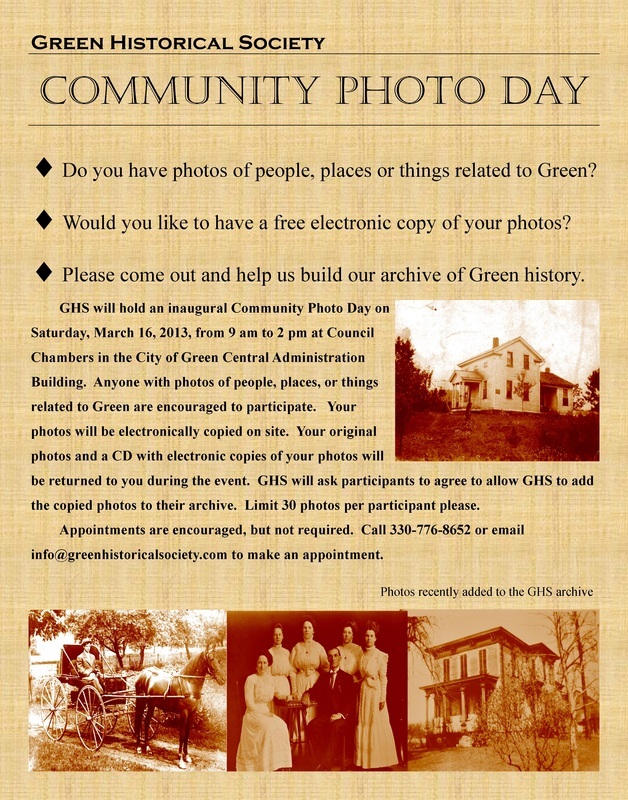 GHS will hold an inaugural Community Photo Day on Saturday, March 16, 2013, from 9 am to 2 pm at Council Chambers in the City of Green Central Admin Building. Anyone with photos of people, places, or things related to Green are encouraged to participate. Your photos will be electronically copied on site. Your original photos and a CD with electronic copies of your photos will be returned to you during the event. GHS will ask participants to agree to allow GHS to add the copied photos to their archive. Limit 30 photos per participant please.